We don't hide behind our label. The CARBION+ formulation reads like a published journal of highly engineered carb sources. Every carb, electrolyte and insulin-receptor sensitizing ingredient is clearly listed. Some call it Transparent Label Protocol. We call it telling the truth. Take a look at other carb products and see if they have some random undisclosed blend of rice, corn and potato. Train with CARBION+ and never look back. Why Do I Need a Carb Drink? Carbohydrates are the most effective and readily available workout fuel you can take. Properly supplemented, they provide a highly stable and reliable energy source for optimal performance - shifting to fat metabolism and protein breakdown via gluconeogenesis is dramatically less effective and reduced performance is the result. Recovery from intense training and replenishment of glycogen stores. to power you through the toughest training." Starting at the high end, AWM2300™ Waxy Maize is highly-branched and extremely complex and comes in at 200,000 g/mol, next in order of complexity is the Rice and Potato starch, while lower in inclusion rates, they are also very high on the molecular weight scale, and range between 80,000 and 120,000 g/mol, CCD™: Clustered Cyclic Dextrin is derived from Waxy Maize (Amylopectin) and has a molecular weight of 60,000 g/mol and finally, DE-5™: Dextrin is the least complex coming in at 45,000 g/mol; all far larger and more complex than the monosaccharides Glucose, Dextrose or Fructose which is 180 g/mol. the length of the chain of glucose molecules"
The degree of complexity of carbohydrates indicates the length of the chain of glucose molecules; at the very low end you have monosaccharides, only a single glucose molecule such as dextrose or fructose. The larger the chain gets, the longer it takes enzymes to break down the links that bind them together. This is where the glycemic index (GI) comes from; the highest numbers come from the simplest, shortest chains because they are absorbed extremely quickly and the most complex and longest chains are the lowest numbers. This is due to the time required to allow the alpha-amylase enzyme to break down the long chain polysaccharides into single glucose, galactose or fructose molecules that can then be absorbed. It is a common myth that these larger chain polysaccharides can be directly absorbed, they cannot. The human digestive tract only absorbs simple sugar molecules. Since these very large chains require such a large amount of digestion, they absorb over a longer period of time. Yeah, yeah, yeah, science, polysaccharide blah, blah, blah, BUT DOES IT WORK in the gym?! We've all heard the stories about the theory of why this or that should work, but does the rubber meet the road? The answer is yes. After a year in production and testing, test subjects reported superior workouts, improved recovery and ability to get back into the gym faster than normal. * Reports have been coming in with exceptional muscle fullness, great vascularity and stunning pumps. So, how do you take CARBION+? PRE-TRAINING: If you are taking it Pre-Training the main goal is to LOAD UP and fill your muscles full of glycogen for maximal performance. This should really only be done when you have depleted your glycogen. So, in the case where you are Cycling your carbs by taking them only around training time and eliminating them outside of training, you would eat few, or no carbs and focus on fats and proteins. Approximately 45 to 60 minutes before training, take 2 servings. You would also take an additional 2 servings following training. 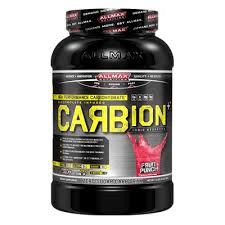 POST-TRAINING: Taking CARBION+ immediately following your event or training is an excellent way to fuel recovery and replenish glycogen stores. This can be combined with CARBION+ taken during training if you have an exceptionally long training session or event. Your level of fatigue should be your guide. 6-SOURCES OF CARBS: All High-Molecular Weight (45,000 g/mol to 200,000 g/mol) that reach the site of absorption at least 30 minutes faster than traditional dextrose or LMW maltodextrin. Since it doesn't sit in the stomach waiting, NO bloating and NO cramping! When CARBION+ gets there it gets broken down by enzymes releasing a steady stream of workout fuel. No insulin spike, no hypoglycemic sugar crash; just steady, reliable energy. * Single forms have only 1 size of molecule and the breakdown, release and uptake of carbs is not nearly as diverse. CARBION+ is loaded with electrolytes to maintain high training performance for a much longer duration; a mere 2% drop in hydration results in fatigue that worsens as hydration drops. Key electrolytes in CARBION+ also enhance glucose uptake.